Highway 99 Blues Club 8 pm - Get your reservations now! RJ Knapp & Honey Robin Are Back! We will be performing as special guests with Randy Oxford All Star Slam. Good times for all and Honey Robin Hugs all around! Let's share the love! The RJ Knapp and Honey Robin band will be featured at the 19th Annual Mt. 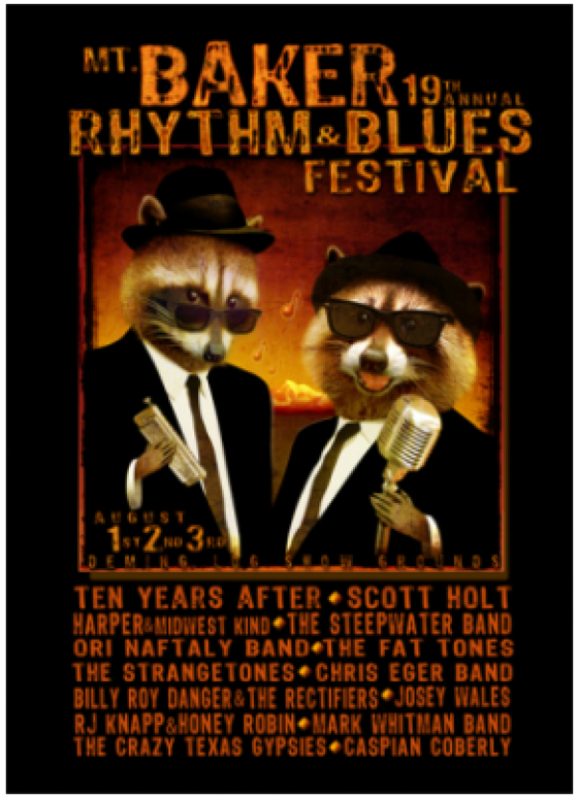 Baker Rythm & Blues Festival, Sunday, August 3, 2014, from 11:00 - 12:30. Get your festival tickets now ! We will be closing out the festival with a bang, on Monday, September 1st! Come on out for the entire festival!!! It's always lot's of fun! We're going to Blast the roof off at the JR's Hideaway Grill - so "Don't Blame The DYNAMITE...If you can't light the fuse!" We will supply the match - and that match will be our music and your bodies!!! Don't miss RJ Knapp's original vocal styling and electrifying guitar picking; Honey Robin's sizzling vocals, Rob Baker's bottom buzzing bass and the thunder of Wayde Leslie's drums! Tickets available at: http://www.brownpapertickets.com/event/371769, which include the pre-festival party at the Naughty Pine Saloon on Friday night! What can be better tahn sharing the best of the blues on the beautiful Clark Fork river, in Noxon, MT? Nothing! Join us at one of the best blues festivals in Montana! Plenty of camping, Heading over to Sturgiss, well ride on in and pre-party with us for a couple of days on the way at the Big Sky Blues Festival! We play 8:00 -9:30pm, but come out and support the whole day! This is a benefit for the Sparks Education Fund for handycapped children. Buster Brewer has been very successful in raising funds for the children, so come on out and make it his best festival yet! Help the kids! We play from 12:pm - 1:30 - but come for the entire day!!! This is a benefit to support the Susan G Komen charity, so come on out and make it his best festival yet! Help the kids! We play Sunday August 31st at 10pm to 11pm! Come on out for the entire festival!!! It's always lot's of fun! We're going to Blast the roof off at the Varsity Inn - so "Don't Blame The DYNAMITE...If you can't light the fuse!" We will supply the match - and that match will be our music and your bodies!!! Don't miss RJ Knapp's original vocal styling and electrifying guitar picking; Honey Robin's sizzling vocals, Rob Baker's bottom buzzing bass and the thunder of Roger Swanson's drums! The Rafael Tranquilino band will be opening for the RJ Knapp & Honey Robin band. Talk about a great night - RJ and Rafael; two of the best quitar slingers around - I'm just saying... this night is not for the faint of heart. Come see the bluz the way your mamma never dreamed it could be! Original, Witty, Rocking Bluz! so "Don't Blame The DYNAMITE...If you can't light the fuse!" We will supply the match - and that match will be our music and your bodies!!! 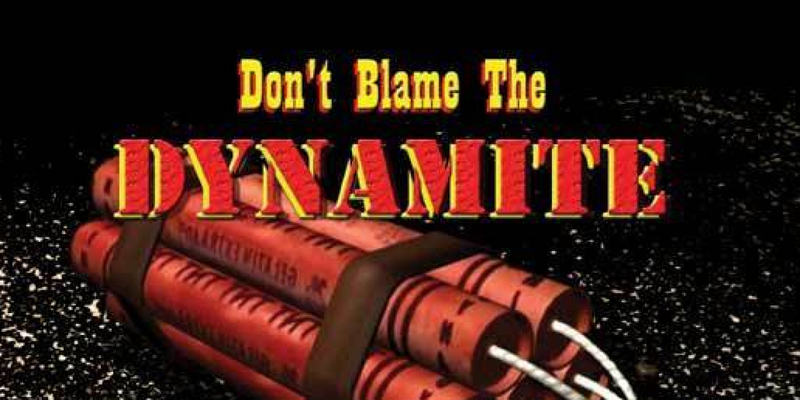 It's Ladies night, so "Don't Blame The DYNAMITE...If you can't light the fuse!" We will supply the match - and that match will be our music and your bodies!!! Honey Robin will be singing her blues heart out. Blues Ladies Rock! Spend a memorable Memorial Day at Maupin's Riverfest with the RJ Knapp & Honey Robin band. You will not want to miss this double concert!!! the RJ Knapp & Honey Robin band will be opening for the internationally renowned Randy Oxford Band!! It just doesn't get to be a better show than that! Come on out, grab your friends and family, and have the best time ever with all of us over at the Jet Bar and Grill! Honey Robin will be joining a fabulous cast of lady blues singers for a night to remember! Mmmmmmmmmmmmmmmmm good Bluz and Good BBQ - I'm in!!! 8Pm - Midnight. We have been very fortunate to have received 4 nominations from the Washington Blues Society 2013 BB (Best of the Blues) Award, for the RJ Knapp & Honey Robin Band and it's members! Come on down and enjoy good food, great music and tons of fun! We will be opening the event at 3:00pm Friday! This is going to be a special night in a couple of ways! Johnny Brewer who plays regularly with Fat James in his backing group "Fatback", will be the acoustic opening performance. And the much BB Award nominated "RJ Knapp & Honey Robin" will take the stage for the electric set! Come on down! Vashon Island Strawberry Festival with three days of the RJ Knapp & Honey Robin band, powered by The Engine Room! 20th = Saturday, Vashon Strawberrry Festival Parade - we will be playing live - in the parade - follow us to the end because we will be your Pied Piper of Bluz! 21st = Sunday, Vashon Music at Ober Park - we will be playing from 1:00 - 1:45 pm! Hot, Rockin' Bluz! Come on down and see us "float" on by playing some, great blues! Tons of fun to be had at the Strawberry Festival! 6,683 views since Wednesday, 04 May 2011.